What is the identity of Leagues new foe? Could he be played in a film by Willem Dafoe? Batman does not think so. Superman surmises Willem's too slow. Whilst Wonder Woman would prefer Bell Biv Devoe. 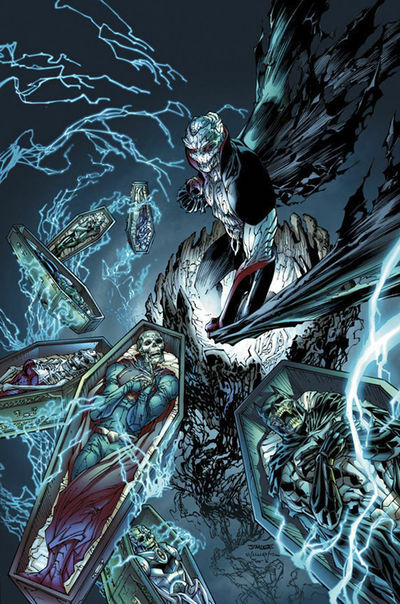 Or maybe Writer: Geoff Johns; Artist: Jim Lee; and Publisher: DC Comics in May 2012. But that could be like poison don't you know. Have you ever been blamed for something you have never done before? If you have, then you must know what it feels like to be a member of the Justice League in this second part of 'The Villains Journey'. Picture the scene if you will; some screw-ball called David Graves has set a plan in motion to get his own back on our justice based buddies. Step one: Scare the bee's wax out of numerous villains so that they can tell him about the League. Step Two: Kidnap League aide, Steve Trevor, and force him to tell him how to penetrate the Watchtower. Step Three: Penetrate. And not in the same way Green Lantern tried to do with one of the Flash's dates. Meanwhile, in the 'Shazam' back-up feature, Billy and Freddy plan to get their own back on two high-school bullies whilst visiting a zoo. Whereas Doctor Sivana discovers some chap called Adam in a cave in Baghdad. Damn right to be continued. How can anybody not chuckle at Hal's and Barry's impromptu tête-à-tête? BARRY: Someone I work with in the Crime Lab. HAL: You never told me you were seeing someone. BARRY: Because you hit on my last date five minutes after we sat down for dinner. I liked Superman's quip also - 'Expect I don't steal his girlfriend' - refereeing to him partnering up with Batman on the side. Now where the 'League' part of this issue is concerned, I did enjoy the 'revelation scene' very much. I felt that it presented to us fans all those juicy snippet's of trivia that we are yearning to hear more of (Martian Manhunter, hint-hint!). Whereas, in the 'Shazam' part of this issue, I did get a right kick of how Billy and Freddie are starting to see each other as pals now. Plus the Black Adam appearance was a right hoot too. I suppose the only small gripe I had with this yarn was the way in which Graves overpowered the League so easily. It just felt formulaic somehow -- as if it was a requirement of the story. Moreover, what was that whole section with Aquaman and Vulko all about? I liked it. But it felt superfluous within this adventure. STORY: On some level the most creative thing about this tale is how the villain, Graves, tries to reveal his motives to his antagonists, the League, by putting them in his shoes. Mentally. Not orally. ART: There is a slash page in this book that I really did dig -- the League attempting to attack Graves. Wow! That's all I can say about it. Wow! Plus can I have a poster please Mr Lee. I promise I won't imply that you're related to Bruce or Stan anymore. AQUAMAN: I thought that Alan Ritchson did such a good job at playing the 'Sea King' in 'Smallville', that I might as well re-cast him again in this role, huh? He is very blonde. Plus I hear that he has a thing for posing with haddock. VULKO: He has a beard. He looks like he knows what he's doing. Plus he was a member of Monty Pythons Flying Circus. So how can I not cast Terry Gilliam as this cleaver wet sod? Well, John Cleese would like to see him submerged in water. Try To Get To Know Your Crime-Fighting Partners A Bit Better By Sleeping With Their Girlfriends. Vote Hal. Although the Christmas ditty 'Santa Claus Is Comin' To Town ' isn't meant to be sinister; in some way it does have a foreboding quality about it that is one-half menacing and one-half jovial. Like this story in fact. Right, Bruce? OK, I have to admit, that as a stepping-stone issue, this book wasn't a bad read really. I enjoyed the 'Shazam' back-up feature a lot; and I hope that we can start to see the overall story taking shape within the next couple of instalments or so. Also, the 'League' strand was only really redeemable due to the fact that we got to see more of this team interacting with each other. Which is always a good thing, right? Continue the motion please Jim and Geoff - just dip the price if you can.